8W May '98 issue, offers are kindly accepted to extend the length of this article! This was F1's first lady driver. As the majority of women who reached the top echelon of motorsport she was Italian - like Lombardi and Amati. 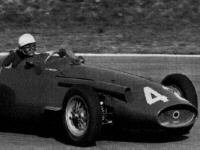 In the early fifties Maria Teresa was very successful in national racing, first scoring some fine results for OSCA and then with her own Maserati. With the help of boy-friend Luigi Musso she entered four Grands Prix with this machine, her best result being a 10th at Spa, two laps down. She signed up with Jean Behra's Behra-Porsche team for 1959 but retired from the sport after Behra was killed at the dangerous Avus motorway track at Berlin.